In Politico this morning, I question whether the president should really be seen as “centrist” or “moderate” with regard to financial reform. His staff goes to great lengths to make this claim, including both the specific quotes and general tone in the Financial Times on Tuesday (May 18, p.7). But if this is the correct way to frame the president’s position, how can we explain the fact that it is moderates – not left-wing radicals – who are pushing (against the White House, among others) for stronger reform both within the administration and in Congress? I suggest another interpretation: On financial reform, the president does not hold the middle ground. The pres is unwilling to stake out a position; has ceded the polictics to surigats; is saying one thing but doing another; is unwilling to endanger his campaign funding; does not really concern himself w/the economic situation of most citizens; is a hypocrite; made a strategic mistake in pursuing healthcare reform (not ‘broken’) vs financial reform (catastrophic failure). He’s fundamentally centrist as much as he’s fundamentally a leader. I read your peace in Poltico, and the two comments by the same fool, and then came here and read joel’s comment above and I have to say, it’s truly depressing the quality of comments on this topic. The healthcare discussions you posited on late last year had far more robust discussions and actual expert input from the commenteriat, you could learn something reading those comment threads. But financial reform, just drags people out of the newsweek woodwork over to places like this where the sun his to harsh for daily intellectual existence. Back to the original point, I found the back and forth between what you have written and tyler cowens analysis over at MR, my most recent ahaa! moment, piecing together this jigsaw puzzle. Why, is a president like Obama, with a unique mandate in many ways, stacking out his current position. One with considerable risk to it. He is not niave, or foolish. Why bother threading the needle, as he seeems to be attempting. 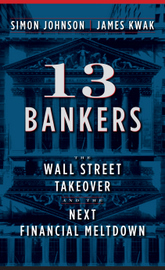 I initially thought he, after recognizing the power of the financial industry, he had opted to accomplish healthcare reform, something he actually cares about, rather than squander political capital battling the financial industry, and i do accept the view that entrenched players like summers and geithner have had some influence. Having known several powerful political figures up close, and watched how they acquire and wield power, I have no delusion that they are controlled by anyone, but are constrained by other powerfull actors. But they will drive where they want to go. I would like to see the debate between you and Tyler furthered, as the crux of the two arguments, that the government, is wedded to the industry as a extension of it’s funding function, and that Bank size matters for that function as opposed to “normalacy” as you present it, i.e functional for the economy and sub 100 billion. What is truly frightening about the implications of Tylers position is that the two are interlinked, and thus power and money have finally merged symbiotically, in very scary ways. We have always assumed this to be the case, but not institutionally as is the current case. In this scenario, even a guy like Obama, when confronted at the embededdness of the financial system with government funding, realized that every other element of his presidency, from saving the economy, to his reform agenda where all dependent on the funding machinery, as it currently exists. And i guess that’s what baffles me, is there seems to be many workarounds of the cancer, to reroute organs to blood supplies. Any way, that’s my two Drachma, I would like to see far sharper minds with much better economics, such as yours, tackle the issue. But looking at the comments left on many of your threads, I think were really doomed. I think Summers and Geithner are living in another world. Unfortunately their world is closer to Goldman Sachs, than to the average American citizens’ world. A world where seven of nine of Goldman Sach’s recommended top trades for 2010 lost money for clients, but Goldman had a 96% success rate on trades for their own account. By MSM/system standards he’s “centrist”, which means really that his positions range from right-of-center to hard right. That leaves actual centrists/moderates to stand in as the freaky left, according to system measures. Any real left, of course, doesn’t exist within the system. Geithner is correct: Obama is at the center and pro-market. Many readers here tend to be liberal and so they think the center lies under their feet. The left is socialism and the right is 1800s (at the very latest) capitalism. Obama is certainly pro-market, just a little less than ‘W’. The problem is that Obama is wrong, not that he is in the center. He has been given an FDR moment and he proposed Clintonesque solutions. Summers is disingenuously correct. Sometimes it is better to not take the largest and most sweeping course of action; Hitler should have taken this advice. But a radical course of action is often the right thing to do. For example, this country was not in favor of desegregation, but Eisenhower sent in the army to enforce a Supreme Court decision. It is called leadership, something Obama clearly does not understand. 1) WHY is someone a socialist for wanting the rules that we had in place for the financial system for about 70 years. It didn’t bother many people then, and the “liberal” clinton is the one that gutted. the socialist mantra here doesn’t fit. 2) Obama’s hypocracy (sp) makes bush like like a puppy. At this point I’ll take Bush back. Yes he is a moron, but I knew where he stood. the current president lied his way into office “yes we can”, and at every turn had stood in the way of rational reform. 3) I voted for a president who talked about usng evidence to make his decisions. he doesn’t it is all lobby money, healthcare, energy, now finance. ware going to stay in Iraq, Gitmo is still there. I hated bush, Obama is worse. he is slick and can fool people very easily. In March, the Real World Economic Review performed a poll — which economists were most responsible for the crisis, “for blowing up the global economy.” Over 7,500 people voted; many of them were economists. Each participant could cast up to three votes. In total, 18,531 votes were cast. Summers is number three according to economists. he is a policy leader. geithner is a summers clone. How more unbiased does soimething need to be to show he has no business in being in any leadership position. Now what kind of person keeps someone like this around. Obama does and this tells you more than anything. I have stated before on this site that you take Obama, ignore what he says, and do a black box analyisis (look at appointments, policies, the practical end points). The conclusion reached is easy. Do it yourself. I knw nobody wants to think bad of the president (Bush got away with it for a long time) we have a natural tendency to give him the benefit of the doubt. payday lenders prey on the poor, so do excessive atm fees. he does nothing about this (he should be in the senate right now talking and pressing the flesh). he isn’t even willing to take on the people who are doing the most harm to poor minorities. that says something about his character. we expect that with a white man from texas. from a minority member it is disgusting. the people being hurt the most from the big banks are the poor minorities (they have only savings and only get interest). I have the stock market, bonds, house. he is hurting the very people who elected and supported him. A jew who drove people to the camps is a traitor to his race. Supporting payday lenders, crazy mortgage rules, etc is supporting the people who feed of african americans. federal reserve interest rate policy does the same, as well as sxcessive atm fees (these areas are under served by banks). Mr. Johnson, good article. glad someone is starting to tell it like it is from the progressive camp instead of the usual Obama hero worship cult i see all too often. President Obama? Two years as a United States (no one knows anything about the guy,except “Yes,We Can”, and “Change” ?) Senator. Votes 75% present on any controversial legislation. Prior, as a State Rep. Chicago,Il. votes present on any ,and all controversial bills 75%! Surrounds himself with shady characters, and embraces Rev. Wright too the fullest extent possible…only for political gain amongst the (we all know what happened to the Reverend) black community? Rahm Emanuel,and David Exelrod both “Chicago Hip` Boy’s” are his leutinents from Clinton. Is the picture becoming clearer? The only reason he faught so hard for “Health Care”? Answer,…the illegal immigrants can partake on the retiree’s dime, period! Nothings changed, other than the fact that he’s obviously feathering his nest for 2012. Recently,…Rahm Emanuel has said he will run for “Mayor of Chicago”, which happens to be the hub of “Illinois Political Power (Structure) Machine”! PS. Why do you think the failed governor story has gone away? Here’s a hint…Obama’s boys called “Rod”, and wanted their own pick too replace Obama as senator,and “Rod” said ,….? Obama cares nothing about no-one except his own selfish legacy,period. I’m glad I’m an Independent! “Whatever way the Wind Blows” my kinda guy? Chris Mathews, host of MSNBC’s Harball reported today that corporatist Meg Whitman’s lead in the gubernatorial Republican primary has plunged from 49% to just 9% in two months over challenger Steve Poizner. Mathews also claims Whitman has spent $68 million of her fortune on media in California. Whitman has been hit by PAC advertising identifying her as a Goldman Sachs board member as well as depositing money into offshore tax haven accounts managed by Goldman Sachs. Polls also indicate Jerry Brown would defeat either Whitman or Poizner if the election were held today. As Simon and James have said all along, this is a long fight. It is heartening to watch participatory democracy in action. It is heartening to see even Republicans turn their backs on corporate communism in waves. Keep the faith folks. I don’t hear no fat lady. Take a look around, folks. None of the last three sitting presidents, no matter what flavor, has looked anywhere but Wall Street for advice and consent. Simon and James have only too clearly made this point in their book (with references). The blinders have been on for at least 20 years, and longer if you look at the history of the collateralized debt obligation. Given that the psychological transformation happened a while back, these “advisers” do – as Ted K points out – live in a different world, that’s what a takeover means. They had an alternate universe built for them and they’re quite comfortable with it. It will take a complete paradigm shift to convince them otherwise. In one sense, the bailout was entirely too successful. Bernanke did learn his lessons well, he saved the day (at least to now). This is what they expected from their head banker. The idea that this might be a prelude to additional seismic shifts, given the over-leveraged, risk-laden, deceptive, and dishonest nature of the trading business the big houses engage in, is alien to them. It really is a fight for hearts and minds. Editor’s Note: The following is the text of a James K. Galbraith’s written statement to members of the Senate Judiciary Committee delivered this May. may pass after all. I wish I felt better sleeping at night, but I don’t think it will help. sigh…. You have not had a seat at the table while decisions were being made by Obama and the banksters about how to handle this mess, and you will not have a seat before the world “crosses the Rubicon”. We have flat run out of time to handle this with decorum and tact – the financial system warning lights are flashing RED all around the world. It’s time to start yelling LOUDLY, and quit pulling punches about what’s going on and what to do next. You have danced around the fact that Summers, Geithner and Bernanke are largely the same group of people that created this mess, and they have been acting in a manner to continue this same mess for as long as possible. It’s time to quit dancing and start swing and landing hard punches. We are all very sorry it’s reached this point, but it’s no longer time for political niceties, it’s time to tell the emperor he’s buck naked. It’s time to tell everybody that we need another FDR, not another Hoover. It’s time. …it is to pass real reform. Give me no more than ten pages… the Volcker Rule and nine more pages. Period! No lawyers. No lobbyists. ….simpler than my MasterCard agreement. Oh well. We can reinstate the guillotine, I suppose. I see one positive thing out of all of this: Given that financial reform is turning out to be approximately as farcical as the vaunted health care reform, by the day of the fall elections, the chances of any incumbent winning are growing far slimmer than before, and that applies to both parties. We now have a government leadership that has been proven to have been substantially, if not entirely bought and paid for. Today the stock market took another massive hit. It was somewhat based upon the weakness of the euro and the reasons (good ones) for it. It was based on the fact that nearly 20% of mortgages still in place are now either delinquent or in foreclosure. It is based on the fact that there are many more entering the unemployment rolls recently than would indicate an “actual” recovery happening. It is based upon another completely botched in ineffectual governmental handling (either prior to or after) of perhaps the greatest ecological disaster in American history. It is based on the markets’ recognition of the fact that a weakening economy will not support the 1.4 quadrillion in notionally valued derivatives now ready to collapse the world’s economies. It is based on the recognition that the “smart money” just doesn’t look very smart at the moment. But then we all know, in this widely manipulated world, that if our ethical standards had always been Machiavellian, perhaps we would never have gone very far beyond the dark ages in terms of human progress. We are all beginning to wonder about the Mayan Calendar, J. Alfred Prufrock, and how guys like Stalin, Hitler, etal, were permitted by their respective societies to be proclaimed as saviors. Maybe we aren’t wondering so much at this moment. I DISCOVERED THIS CRIMINAL ACT WHEN I HAD A TITLE SEARCH RAN ON MY PROPERTY LAST MONTH DUE TO THE COMMUNITY PROPERTY ISSUE CAUSED BY GOLDMAN SACHS. UNBEKNOWNST TO ME, I FOUND THE “SMOKING GUN”. THESE LAST MINUTE FALSE ASSIGNMENT SCHEMES ARE DONE BY ASSIGNING FALSE DOCUMENTS FROM THE TRUE MORTGAGE HOLDER IN ODER TO OBTAIN THE PAYOFF FUNDS AT THE AUCTION BLOCK ONCE THE PROPERTY IS SOLD. THE STATE OF MASSACHUSEETS IS INVESTIGATING AND INDICTING THESE TYPES OF SCHEMES HEAVILY DUE TO THE “KATRINA LOANS” THAT GOLDMAN SACHS LEFT THEM WITH. WHY GOLDMAN SACHS IS CAUSING ME HARM AND COUNTLESS OTHERS. IT’S PURE GREED! IT LOOKS LIKE THE MILLION DOLLARS THAT GOLDMAN SACHS MADE ON THE CREDIT DEFAULT SWAP FROM FORCING MY LOAN TO DEFAULT ON 5-11-09, MAY HAVE RUN OUT. I HAVE BEEN IN LITIGATION WITH THESE CROOKS, SPENDING THOUSANDS OF DOLLARS IN ATTORNEYS FEES AND HAVE BEEN PROVIDED WITH MOCK HEARINGS SINCE FEB 2009, TRYING TO SAVE MY HOME. WE NEED SOME JUSTICE HERE! OBAMA, I’M DISAPPOINTED IN YOU, WHAT ARE YOU DOING? Visit my blog at http://bushnellcomplaint.blogspot.com/ to see the pending case information.